Starts a new show. This show is not completely empty: a camera layer, two light layers and a text layer have been created for you. Opens a show from disk. Changes the duration (length in seconds) of the show. Changes the export resolution (size in pixels) of the show. Presets are available for all common resolutions including SD, HD and UHD. Opens a dialog where you can enter the show title, info and content. Saves the current show under the current name. Saves the current show under a new name. Saves the current show and places all used media files next to the .BT show file. This option is useful when you want to copy a show to another computer or to a web server. Exports the current screen as a .BMP or .TGA file. Exports the animation as a video file. On this page you can find more info about exporting shows. Starts the show from the beginning. Stops the show. You can also press the <Escape> key. Loops the show continuously. Press <Escape> or the stop button to stop. Loads and plays the previous show. Loads and plays the next show. Clears the cache and reloads the current show. Stops loading the current show. Opens and runs the home page, as set with the menu item SETTINGS > Options. Displays a dialog that allows you to change all texts the show is using, which is very useful for templates. Texts like ---------- or .+.+.+.+.+.+ are by default hidden because it is unlikely they are meant as dynamic texts. Mark the Show All checkbox to show them. Displays a dialog that allows you to change all fonts the show is using, which is very useful for templates. Displays a dialog that allows you to change all textures (pictures) the show is using, which is very useful for templates. Reflectionmaps, bumpmaps and other special textures are by default hidden because it is unlikely they are meant as dynamic textures. Mark the Show All checkbox to show them. Displays a dialog that allows you to change all effects the show is using. Adds a camera layer to the show. Adds a light layer to the show. Adds a plasma layer to the show. Adds a text layer to the show. Adds a traced picture layer to the show. Adds a EPS layer to the show. Adds a scroller layer to the show. Adds a picture layer to the show. Adds a video layer to the show. Adds a video capture layer to the show. Adds a skybox layer to the show. Adds a VR 360° layer to the show. Adds a landscape layer to the show. Adds a water layer to the show. Adds a particle layer to the show. Adds a waving flag layer to the show. Adds a sketch layer to the show. Adds a model layer to the show. Adds a hand layer to the show. Adds a mirror layer to the show. Adds a voxel layer to the show. Adds a audio layer to the show. Adds a colourmap layer to the show. Adds a cubemap layer to the show. Adds a container layer to the show. Attaches a border to the active layer. Attaches a plasma layer to the active layer. Attaches a particle layer to the active layer. Attaches a lightning layer to the active layer. Attaches a lens flare layer to the active layer. Attaches the active layer to an existing container, camera or colourmap layer. Detaches the active layer from its parent container, camera or colourmap layer. Deletes all layers attached to the active layer. Makes the active layer stand in the landscape layer. The vertical position is now relative to the landscape surface. Makes the active layer float in the water layer. The vertical position is now relative to the water surface. Deletes the active layer. All attached layers will also be deleted. Be careful not to delete all light layers, unless you love the dark. Makes an identical copy of the active layer. Brings the active layer backward. Notice that this only makes sense for picture layers in 2D mode. All other layers are automatically sorted by their distance to the camera. Brings the active layer forward. Notice that this only makes sense for picture layers in 2D mode. All other layers are automatically sorted by their distance to the camera. Opens a dialog where you can enter the layer name and link. Changes the text of the text layer. Most of the time you will use the textbox on the tool window for this, but for long texts or when using dynamic content this dialog can be handy. Sets the font for the text layer. If you want to change the font of all text layers you have to mark the All Layers checkbox before choosing this menu item. Do not forget to unmark this checkbox afterwards. When BluffTitler says it can't handle a font this is usually caused by the fact that the font is too detailed. You could try using the flat or solid styles or switching to a lower quality mode with the menu item SETTINGS > Low Quality. Sets the EPS file for the EPS layer. Changes the audio file used by the audio layer. Changes the model file used by the model layer. Changes the effect of the active layer. Loads a preset from disk. A preset is a layer with 1 key. The preset dialog only shows presets of the same layer type as the active layer. It also takes hierarchy into account. Saves the active key of the active layer as a preset to disk. Saves the current playlist under the current name. Saves the current playlist under a new name. With this menu item you can show/hide the tool window. With this menu item you can show/hide the browser panel. With this menu item you can show/hide the playlist window. This option renders the camera coordinate system in the lower left corner, the local coordinate system of the active layer, the crosshair and the grid. This sets the visual quality. On an average computer edit in normal quality, export as video in high quality and export as picture in super high quality. Opens a dialog where you can set the options. At any time you can switch between the EASY and the PRO versions with this menu item. Depending on your license, the application reverts to the demo (evaluation) version. When you buy BluffTitler you receive your own personal license keys. Select this menu item to enter them into the app to turn the evaluation (demo) version into the full version. Opens the BluffTitler user guide in your default internet browser. Pressing <F1> does the same. Opens the BluffTitler community in your default internet browser. On this site can share tips and tricks with other users, show your work, download free templates and ask questions. Opens the BixPack site in your default internet browser. On this site you can purchase professional, royalty free BluffTitler templates. When hitting this item BluffTitler starts playing random shows from the Media/Shows folder. Press <Escape> to quit this demo mode. Connects to the internet for information about the latest version, updates, upgrades and downloading old versions. When you choose FILE > Open show..., a file dialog is presented that looks like this. The templates are from BixPack 25. Click on one of the folder names in the upper left to select a parent folder. Double click on one of the blue folder icons to select a child folder. Double click on a file to select that file. When you right click on a file, a menu is presented that allows you to open, rename or delete that file and to create a new folder. Click on the App button in the upper richt to jump to the templates that came with the installer. Click on the Personal button to jump to the default save folder. Click on the Desktop button to jump to the desktop. Choose SETTINGS > Options... to open the options dialog. With this option you can translate the BluffTitler GUI. All interface texts, except the error messages, are translated. The translations that come with the installer can be found in the BluffTitler/Media/Locales folder. Visit the download page for a list of all the available languages. This is the show that is opened when you start BluffTitler or click on the Home button. This folder is added as a button in the upper right corner of the file dialog for quick access. Temporary files are automatically deleted after use. To make sure they are also deleted in case something went wrong, all temporary files older than 1 hour are deleted next time you start BluffTitler. On Windows 10, the default folder is C:\Users\[USERNAME]\AppData\Roaming\Outerspace Software\BluffTitler\Temp. Use a folder an another drive when your C drive is almost full. This is the maximum texture resolution. Bigger textures are scaled down to this resolution. It can be used to prevent out of video memory issues when using super high resolution photos. Set this value to 0 to accept all resolutions. This is the font that is used when you choose FILE > New show. The default font is also the font that is used when a font can't be found or loaded. This is the font that is used for rendering the emoji characters. The default value is Segoe UI Emoji. Optional you can use Segoe UI Symbol or OpenSansEmoji. Full SBS. The 2 screens are rendered side by side, without adjusting the PAR. To keep the same viewport, double the width in the FILE > Set show resolution dialog. Half TAB. The 2 screens are rendered on top of each other (Top and Bottom) with a halved PAR. Full TAB. The 2 screens are rendered on top of each other, without adjusting the PAR. To keep the same viewport, double the height in the FILE > Set show resolution dialog. When this checkbox is unmarked and you open a show, the resolution is changed to the resolution that is stored in the show file. But when this checkbox is marked, shows are always opened in the very same resolution. Click on the Select resolution... button to set this resolution. 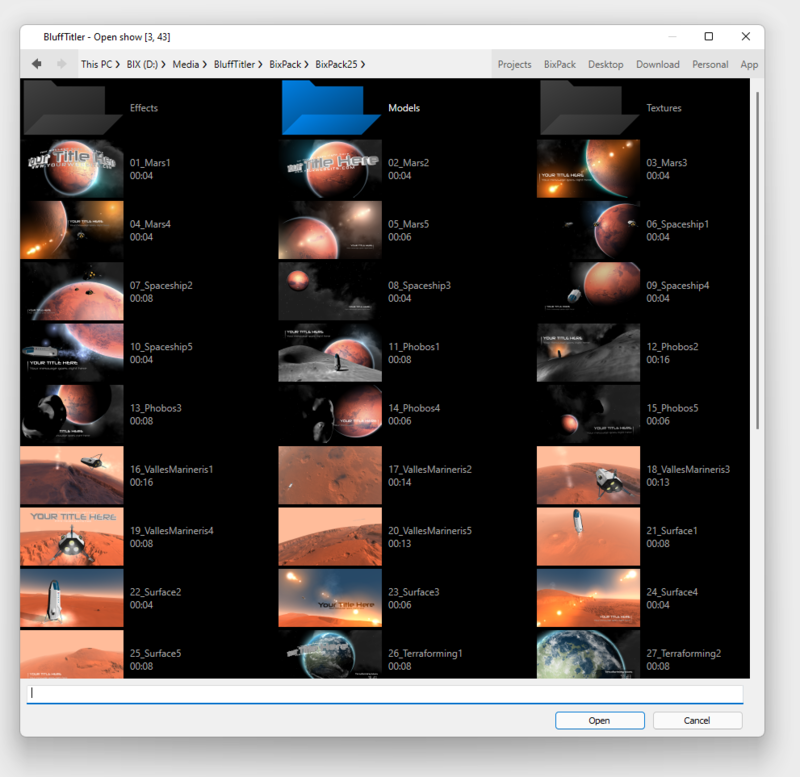 The BluffTitler executable is an editor as well as a player. Choose SETTINGS > Tool window to switch between the two. When you start BluffTitler by double clicking on a show file, it starts up in player mode. When this checkbox is marked, it starts up in edit mode. When this checkbox is marked, all layers are hidden that are not root layers or parent or child layers of the active layer. This can make the layers dropdown look more clear. When this checkbox is marked, a minus sign (-) is added to the property name when it has a non-default value. This makes it easier to find out how to recreate an effect. Mark this checkbox if you prefer to use the standard Windows file dialog. When this checkbox is marked, the show is unloaded before the MP4 encoder is started. This frees precious memory that can be used by the encoder. On an average system this is only necessary when exporting in 4K or higher.